12.12.2014 (Hvino News). A rally held by Georgian Airways in protest of the unlimited flow of Russian airlines to Georgia, was joined by Georgian tourism companies on December 11. The companies stated that the country lacks regulations that support the local industry. Georgian Airways released an eight-point list of demands on December 10, out of which only one was met. Two Russian companies Aeroflot and S7 will be able to carry out 10 flights a week instead of 14. However, Georgia Airways leadership claims that the decision will not solve the problem and insist that all their demands are fulfilled. These include the rejection of the July 8 decree that allows Russian companies to undertake unlimited flights to the Tbilisi-Moscow-Tbilisi route, restoration of flights between the two countries that existed in 2006, negotiations with Russian representatives in Georgia, separation of the National Aviation Agency from the Ministry of Economy and making it a separate entity, hiring qualified staff for the agency and resuming the status of a flagman to Georgian Airways. Otherwise the company threatens to block the airport. “Georgia’s airport is owned by a Turkish company, while the sky is going to be possessed by Russian companies. There is no space left for Georgian companies,” General Director of Georgian Airways Iase Zautashvili said. According to a head of one of the tourist companies, Maia Mchedlidze,the absence of regulations create poor conditions for the local industry. “There are no regulations that can enable us to compete with foreign companies. Egyptian and Turkish airlines arrive to Georgia with low fares. They make prices lower and make Georgian tourist companies to do the same… They have huge financial resources, while we lack the resources. We schedule charter flights with Airzena. Thus, we are dependent on each other. Foreign companies are trying to bankrupt us through low prices in an effort to take over the Georgian market,” she says. 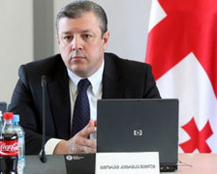 Commenting on the issue, Minister of Economy Giorgi Kvirikashvili said that there are two sides in the issue – the interests of local private companies and tourists. “We are in negotiations with the Russian side and the talks are still not complete. Owing to the lack of diplomatic ties, we communicate on a technical level with Russian representatives. The turmoil is unclear for me when the negotiations with the Russian side have not yet been finalized. However, we will not assist private companies at the expense of reducing tourist number in Georgia,” Kvirikashvili said. Russia's flagship airline Aeroflot began daily direct flights from Moscow to Tbilisi in October 2014. In September 2014, Russia's federal aviation agency announced that 6 more airlines were granted permission to fly to Georgia, including VIM-Avia, Globus, S7, Transaero, Ural Airlines and UTair.